The recent flooding of the north of the country may be exercising the insurance industry at the moment but in due course mortgage lenders and those working in property risk will need to understand the impact of this data upon their lending decisions. If there was ever an example of data creating business value, this is undoubtedly it; however, the use of the data is now going beyond the decision to lend and is enabling lenders to develop models that ultimately can become the basis of competition. We only have to look at the role of data in transforming our daily lives to see this process is well underway in other industries. Streaming services such as Netflix and Itunes have usurped not just the process of buying or viewing content but also the added value that the local record or video store used to provide when making recommendations. Content delivery services utilize a vast array of data points to generate recommendations. By analyzing what is viewed, when, on what device (and even whether the content was fast forwarded, rewound or paused), as well as user activities such as internet searches, and browsing and scrolling within a webpage, recommendations can be tailored for millions of customers in real time and approximately 75% of views at a leading provider are now driven by these recommendations. Today, it is estimated, we generate more data in 10 minutes than all of humanity has ever created through to the year 2003 and financial services businesses have always wanted to derive insights from information in order to make better, smarter, real time, fact- based decisions (think of credit scoring): it is this demand for depth of knowledge that has fueled the growth of big data tools and platforms. In terms of lending, the landscape is changing at a pace in the operational sphere. Possibly because it is the last great unreformed area where margin savings can be made, and because regulatory scrutiny of sales and capital controls has meant its time has only just come. Those leading the charge are now including big data from both within and outside the company, including online and mobile data to supplement their organizational data and provide the basis for historical and forward-looking (statistical and predictive) views. Integrating and moving data across the organization has traditionally been constrained by data storage platforms with limited abilities to process very large volumes of data generated or received at very high speeds. But lenders and valuers alike are starting to catch up with other industries and start managing data through different sources, and integrating its usefulness via a range of technologies in the market. Traditional ways of behaving, that may have once appeared set in stone, are now changing. It is a continuous enhancement process of what is there – developing a new industry standard that benefits everyone to a greater or lesser extent. Big data will fundamentally change the way businesses compete and operate. Companies that invest in and successfully derive value from their data will have a distinct advantage over their competitors — a performance gap that will continue to grow as more relevant data is generated, emerging technologies and digital channels offer better acquisition and delivery mechanisms, and the technologies that enable faster, easier data analysis continue to develop. While the ability to capture and store vast amounts of data has grown at an unprecedented rate, the technical capacity to aggregate and analyze these disparate volumes of information is only just now catching up. It’s worth re-iterating that it is important not to assume that Big Data is all about sales. With so many decisions in financial services concerned with risk judgements, it’s arguably here that the biggest impact will be felt. 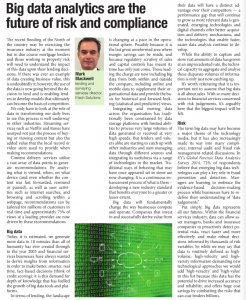 The term Big Data may have become a major theme of the technology media, but it has also increasingly made its way into many compliance, internal audit and fraud risk management-related discussions. In EY’s Global Forensic Data Analytics Survey 2014, 72% of respondents believe that emerging big data technologies can play a key role in fraud prevention and detection. Managers are learning to embrace the evidence-based decision-making process while businesses have to redefine their understanding of “data judgements”. Put simply, Big Data represents all our futures. Within the financial services industry, data can allow asset managers, banks and insurance companies to proactively detect potential risks, react faster and more effectively, and make robust decisions informed by thousands of risk variables. So while we may say that data is routinely defined as high-volume, high-velocity and high-variety information demanding new technological approaches we would add ‘high-veracity’ and ‘high-value’ to this list because this data has the potential to drive increased accuracy and reliability, and offers huge cost savings by combatting the risks that can cost lenders billions.